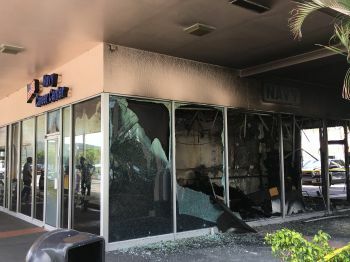 Details of the incident, which occurred at around 2:00 AM, remain scant, but the suspect, who is said to be in custody, firebombed the offices of the federal recruiter in the Nisky Shopping Center. The offices hosted recruiters for Navy, Army and Air Force. It is unknown whether a motive for the attack has been established. [US] Virgin Islands Police Department (VIPD) Public Information Officer Glen Dratte said the incident is being handled by the federal government, and that information had been transmitted to the VIPD, which will be issued to the media. The suspect is said to have also targeted the Coast Guard offices on the waterfront next door to the Senate Building and the Ron de Lugo Federal Building also on Veterans Drive, and at first glance none of those buildings show signs of damage or attack. However, according to a press release Government House issued on Tuesday afternoon, VI Fire Service personnel extinguished a fire which was burning palm trees, plant boxes, and an area of lawn at the Ron de Lugo Federal Building. They simultaneously suppressed a fire burning an area of lawn at the Coast Guard building. Both situations were under control within ten minutes, according to Fire Service officials. There were two VIPD police SUVs parked outside the Coast Guard offices at 11:00 AM on Tuesday. VIPD Commissioner Delroy Richards told The Consortium that he learned of the incident at around the time it occurred. Mr Richards said he was told that the man currently being held by the Federal Bureau of Investigation, was most likely not from the territory, and was driving a truck with gasoline containers at the back when he was apprehended. The Government House release says a major effort was launched immediately to investigate the series of attacks on the federal properties. 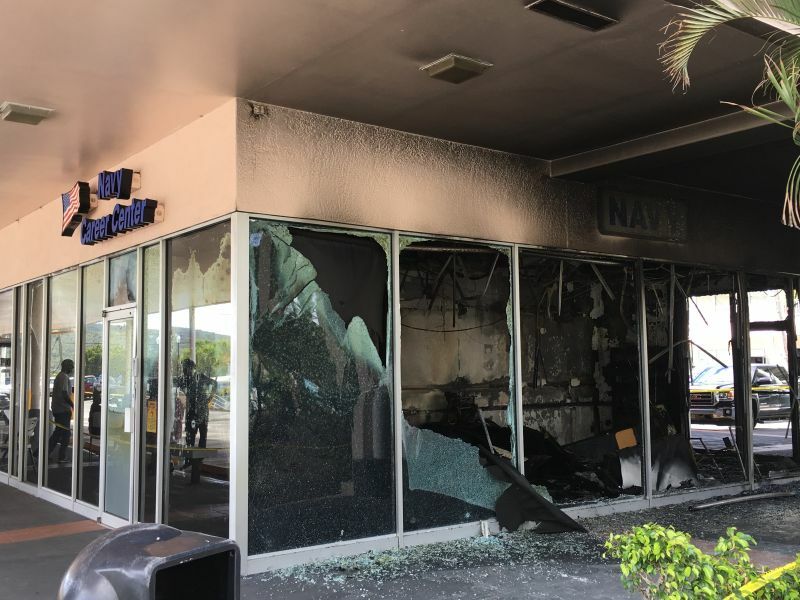 The United States Coast Guard Investigative Service, the FBI, VIPD and the VI Fire Service Arson Prevention and Investigation Unit were among the initial agencies involved. Officials have offered no details about the person being detained, or how he may have been linked to the fires. There have been no reports of any injuries resulting from these fires, according to Government House. This is serious! too close to home. Hope he is not connected with isis or any other islamic group or else the V.I. in trouble. Attack on Federal office of the USA on American soil in the Caribbean is a death knell for the Caribbean. With or without a Muslim or Trinidad Connection,tis bad. We their mellanated nextdoor neighbour with our wide open waterways and our Muslim Community and our bunch of illegal very comfortable immigrants and relatively lax immigration and our coveted economy and OffShore Banking need to Pay Attention. And to imagine, his face was PAINTED BLACK!! !